This article is reposted by permission of the author and Farm Credit Canada. It was originally published in the March 2019 issue of FCC’s magazine, AgriSuccess. Subscribe today. Sustainable production is central to the farm’s operations. Chemical fungicides or pesticides are not primarily used, instead, the focus is on managing pests using biological controls. That’s unusual – controlling pests 100 per cent biologically in propagation requires close monitoring and a commitment to accepting some crop damage if an outbreak does occur. “This is a big deal – it’s finger-on-the-pulse kind of work, and we accept the damage so we can keep the biological program viable. Once you bring chemicals in, it destroys the biologicals,” Jan explains. They also burn wood biomass for heat, have solar installations on some of their roofs, and just recently started to generate baseload electricity for their internal use, re-using the heat from the natural gas generator to help heat the greenhouses. As well, all of their irrigation and fertilization infrastructure are recirculating closed systems. “All the water we draw goes out in the form of cucumbers, and nutrients are recirculated and reused,” he says. Sustainability also means ensuring social license to operate. Beverly Greenhouses often opens its doors to tour groups, from food writers and culinary professionals to McGill University agriculture students and grade-school classes. According to Jan, the goal is to help people learn how food is produced and understand the level of care, automation and technology that goes into growing greenhouse vegetables. Politicians at all levels of government are another target audience; the hope is they’ll consider potential impacts on agriculture when making policy decisions. That desire to contribute to smart regulation and keeping the industry competitive is why Jan also volunteers a lot of his time to different horticultural organizations. 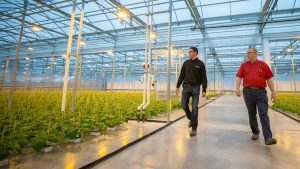 He currently chairs both the Ontario Fruit and Vegetable Growers’ Association and the Ontario Greenhouse Alliance and holds director positions with the Ontario Greenhouse Vegetable Growers and the Canadian Horticultural Council. It makes for an often-dizzying schedule and long days away from home, but Jan believes the payoff is worth it, both for his farm and the broader industry, especially when lobbying efforts effect positive change. Beverly Greenhouses’ work force is one-quarter local Canadian employees and three-quarters seasonal workers from Mexico, so access to labour is a high priority. Without the foreign employees, many of whom have been working for the VanderHouts for years, the business wouldn’t have grown to the size it is today – and future expansion wouldn’t be a possibility either. Increasing environmental regulation coupled with what Jan calls a growing enforcement mindset is also a challenge. With 80 per cent of Ontario’s greenhouse vegetable production going to the U.S., trade and border flow is crucial. But that’s also where Jan sees almost limitless potential, especially with the Chinese market starting to open up to Ontario-grown glasshouse produce. It takes only 15 hours by climate-controlled aircraft for a cucumber to make its way from an Ontario greenhouse to the world’s largest consumer market, where Canadian products are highly sought-after. Long term, the VanderHouts are optimistic about the future and hope to continue growing – pun intended, he says with a chuckle. From an AgriSuccess article (March 2019) by Lilian Schaer.